When you want to expand an iconic building from the past, whom do you call? The case of Kimbell Art Museum was a long one emphasized by the fact that it was designed by one of the very best American architects to have graced the earth: Louis Kahn. The old Kimbell Art Museum was conceived in 1964 upon the death of Kay Kimbell and born in 1972 when the building was realized in Fort Worth, Texas. It was the last building to be seen to completion by Louis Kahn. His projects were few and far between because he practiced for a very short time, yet his touch was sublime so much so that his buildings have become timeless landmarks. Renzo Piano had worked in Louis Kahn’s office in the 1960s and the board in charge of the expansion of the museum thought that perhaps there was no better person to appoint for the expansion than one who had learnt his skills under the proprietor of the initial design. The result of that appointment is the expansion that now lies directly in front of Kahn’s building. The front section of the new building faces the West façade of Kahn’s building and was designed to have three parts. The middle part of that façade is a transparently glazed lightweight section that acts as the main entrance to the building. On either side of the glazed entrance are two pale concrete walls which hide two galleries behind them for temporary exhibitions. 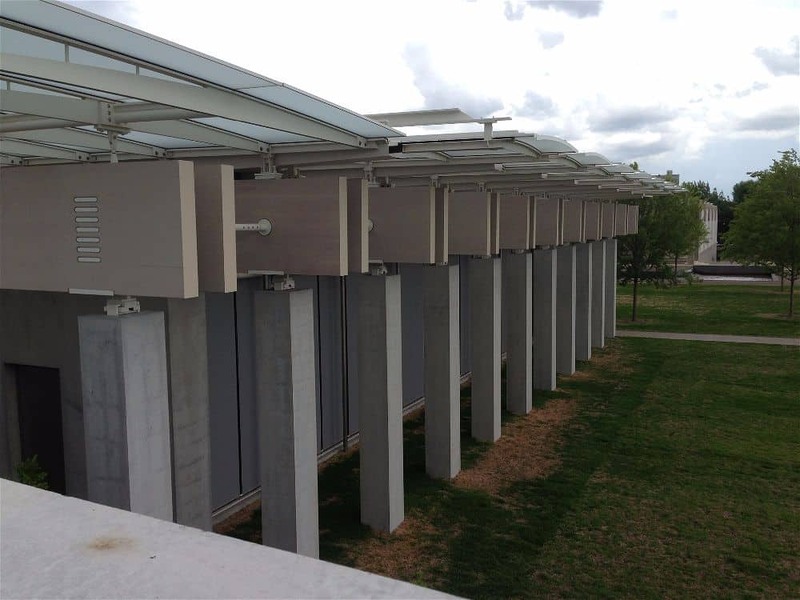 On each side of the building, square columns were designed to provide solid support to the wooden beams used for the roof support and the overhanging eaves of the glass roof. The columns also double up as sun-shading elements for the glazed parts of the building that are facing the north and south. Architect Renzo Piano did his due diligence in researching about Louis Kahn’s designs. He studied his intentions for the old museum and how he had managed to light the building with natural light so efficiently. However, for everything nice that exists on earth, there are always compromises and mistakes abound. Louis Kahn had managed to get the natural light into the building, and like any other masterpiece, there were flaws. The light was getting in alright, but the distribution was not figured out very well. That is something architect Renzo Piano wanted to solve. To solve that flaw in the new design, the roof would play a huge part. Renzo Piano Building Workshop (RPBW) engineered a unique and elaborate roof system for the new building. The roof would float above massive wooden beams arranged in doubles. It included a layer of high-efficiency glass which would support aluminium louvres with built-in photovoltaic cells. The result would be a ceiling that glows in the galleries when sunlight filters through the glass roof via soft, silk-like scrims. Sunlight coupled together with LED technology enhanced lighting provision through the roof and allowed for easy distribution across spaces and galleries. The energy collected through the photovoltaic cells further enabled green energy to be incorporated into the building’s energy needs. The new facility now consumes only a quarter of the energy the Kahn structure uses every year. Renzo Piano wanted to make the new building resemble the old one as much as possible. It was a struggle of trying to build yet another masterclass while respecting that one of the old. He studied Kahn’s building in terms of scale, height and general layout. The realization was that building upwards would totally destroy Kahn’s building in terms of scale; so the new building was enhanced underground. Half of the building’s spaces are hidden below the ground leading to two buildings that totally respect each other in layout and size – at least above the ground. A glazed passageway leads you to the second part of the building that houses a third gallery for light-sensitive works, a 299 seater auditorium, classrooms and studios for the museum’s education department and an expanded library. An underground parking was also accommodated for. Visitors arriving through the underground parking will find themselves facing the main entrance to Kahn’s building on one end and Piano’s Pavilion on the other end. Somehow, that rewrites a wrong that Louis Kahn had done decades ago. By placing the parking behind the building, Louis Kahn had caused visitors to enter the old museum from the entrance at the back instead of coming to the front of the building. With Piano’s new building, that error has now been corrected and visitors experience both main entrances to these two buildings when they come from the new basement parking. Kahn’s building was becoming smaller and smaller with each day that passed. In 1989 plans to expand the museum were shelved after protests by designers and Kahn’s daughter, Sue Ann, following a proposal by Kahn office veteran Romaldo Giurgola which suggested extruding Kahn’s iconic vaults to create more space for the museum. Enter Renzo Piano. What started as a dramatized expansion in 1989 has become yet another masterclass of our generation fusing the quintessential building of yesterday with that of today. The motif of transparency and openness is emphasized in the new building, with amazing views to the old building and the garden from the lobby. It’s a building typical of Renzo Piano’s love for steel, wood and glass. The museum that has now been dubbed Piano’s Pavilion by the owners is one of the best works by Renzo Piano, in the same league as his other works like The Shard – Europe’s tallest building, The Menil Collection & Cy Twombly Gallery in Houston, and the Nasher Center in Dallas. It’s a no wonder Renzo Piano was awarded one of Italy’s highest honors when he was proclaimed senator for life in 2013.